Buying a second hand motorhome or campervan can seem like a daunting prospect. New vehicles usually come with a good warranty and manufacturer support, there are fewer potential problems to look out for, plus you can marvel at your shiny, brand new toy! However there are many advantages to buying second hand, the prices are usually more reasonable, allowing you to get more for your money, there can be more makes and vehicles to choose from, from discontinued models to classic campervans, and more dealers and private sellers available, giving you a better chance of getting a good deal. Even impulse buyers and shopaholics should do their research when considering buying a motorhome or caravan. Think about what you want your vehicle for and where you will be travelling? For instance, if you dream on taking 6 months out to travel around Europe you will need a very reliable and comfortable vehicle, however if you want a cool vehicle for your next surfing trip, you could look into a classic VW campervan. Also think about where you will be storing your vehicle. This can affect the safety of your vehicle and your insurance premium. Think about the kind of layout you need. How many people will usually be travelling? What facilities will you need to be comfortable? There are a huge range of layouts out there, so it is important to prioritize. Kitchen – If you’re thinking of dishing up 3 course meals then you may need more than a standard kitchen. Most motorhomes and caravans come with 3 hobs, but many smaller models or campervans only come with one and can have small sinks. You will probably need a fridge, or space for a fridge too. The market – Finally, get to know the market well, perhaps contact a number of sellers and don’t be afraid to visit a dealer with no intention to buy. It’s also a good idea to search the web and use forums to ask for other’s opinions. Take your time, buying a second hand motorhome or caravan can be quite a commitment! Keep the original advertisement, as legally the vehicle must be “as described”. Have the seller put all details in writing, including any known problems. Ask to see the motorhome or caravan at the sellers house, ideally in good weather. Take a friend with you both as a witness and for morale support. They may spot something you don’t! Make sure you see the vehicles full documentation and proof of ownership, along with the chassis and engine number where applicable. It is advisable to buy a history check from the AA or RAC. It’s also worth getting the vehicle inspected, both companies also offer this service. Check all the equipment, especially anything electrical. Check the seats, and fittings. Also check the tires and exterior very carefully, looking out for rust. And of course, make sure you take motorhomes or campervans for a test drive! It is advisable to Call HPI Equifax (01722 422422) to see if any outstanding finance is owed. Buying a second hand motorhome or caravan from a second hand dealer can offer greater security to the buyer as the vehicle will usually come with a guarantee and the dealer must ensure everything is safe and in good working order. Of course, buying from a dealer is usually more expensive as the price also includes a profit for the seller. If you choose to buy from a dealer, remember to insist on seeing all the relevant documentation as detailed above and take the vehicle for a test drive. Also keep a copy of the original advertisement and ask the dealer to put any issues or important information in writing. You will probably find many second hand dealerships local to your area. Specialist dealers can also be found online via search engines. 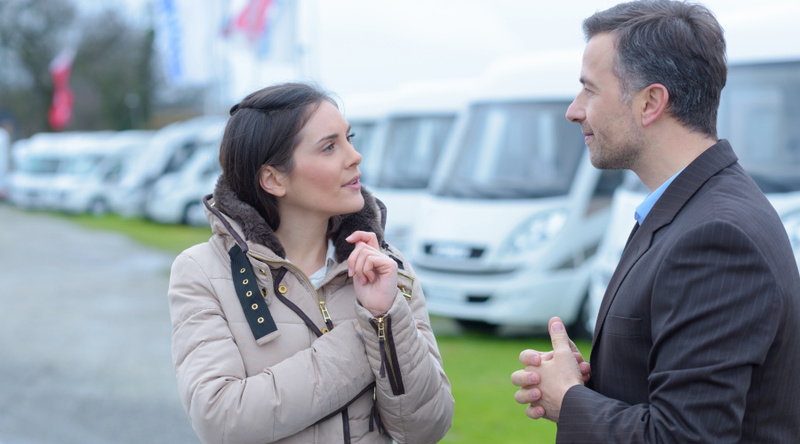 If you are buying a second hand motorhome or caravan privately, the internet has also become a valuable tool, with several sites connecting sellers to buyers. Once you have bought your vehicle, you will probably want to get driving it as soon as possible. Insure My Stuff 4 Less can compare quotes for motorhome insurance and caravan insurance and allow you to purchase quality cover within a few minutes.